No video in certain chapter. Hi Dayangku, you have reached OpenLearning general support channel. We are sorry for the inconvenience caused. It seems the course design is incomplete. We have notified the course facilitator regarding this issue. You can also contact them by sending them a private chat message or comment anywhere on the page such as the Homepage. I have some problem to complete my task on this:- Alice, an account clerk has provided accruals for electricity and water bills for the month of December 2016, even though she yet to received the bills during the month. i already put all 10, unfortunately is incorrect. Please help me to complete my assignment on this portal. 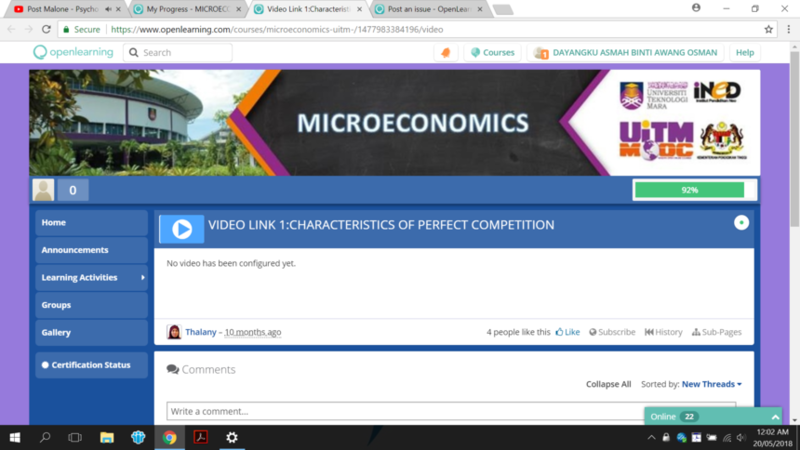 Hi NURUL HANIN BINTI MOHAMED NOOR , can you share the link to the course page that you have mentioned so we can take a look? NURUL HANIN BINTI MOHAMED NOOR which questions that you did not manage to get it right? It seems all the setup for all question is correct. I'm afraid that you have spelled it wrong. khairulkhairiz qtn no 4. Alice, an account clerk has provided accruals for electricity and water bills for the month of December 2016, even though she yet to received the bills during the month. when i read at comment from others, some people face with same problem with me. saya sudah memcuba untuk letakkan semua jawapan tapi tetap salah...dan ramai juga yang menghadapi masalah yg sama dengan saya...iaitu solan no 4. Hi NURUL HANIN BINTI MOHAMED NOOR , Sila cuba hantar sekali lagi jawapan bagi soalan nombor 4 itu. Sila bagitahu kami jika adakah anda berjaya untuk menjawabnya. Hi...oke dah dapt dah buat...terima kasih.